While not obvious to anyone walking the streets of this picturesque city, it was not the first choice for the job, but instead born out of a compromise between those in power. Located along the Potomac River on the East Coast, Washington DC is actually not a state, but a district established by the constitution. It borders Arlington and Alexandria in Virginia and Montgomery County and Prince George’s County in Maryland, and includes land that was donated by each state when it was first established. President Washington chose Washington DC to be the Capital of the United States and specified the exact spot, adjacent to the Potomac and Anacostia Rivers. The District would include a small bit of land ceded by both Maryland and Virginia and would be designed by Pierre Charles L’Enfant, a French Architect and Civil Engineer. L’Enfant’s vision was modern and compelling, and included grand boulevards and magnificent ceremonial spaces similar to those in Paris. The entire city would be designed on a grid, with all points leading to the Capitol Building. It wasn’t too long after DC was established that war and enemy forces nearly took it all away. Great Britain’s army invaded the city in the midst of the War of 1812 and subsequently set fire to much of the city. The recently completed White House, the U.S. Capitol Building and the Library of Congress were burned to the ground. Resulting from Washington DC’s early adoption of the Emancipation Proclamation, the city increased in size when it became an unofficial hub for freed slaves during the Civil War. Because of this, and the fact that abolitionist Frederick Douglass took up residence there, the African American population grew steadily within the city. After the War of 1812 and the Civil War, Washington DC expanded by absorbing Georgetown and several surrounding areas that were outside the boundaries of L’Enfant’s original designs. Neighborhoods developed downtown and around the Capitol and the White House and streetcar lines were expanded adding even more energy to the growth of the city. In the early 1900s, DC was the first city in the United States to undergo urban renewal projects as part of the “City Beautiful” movement. In 1901, The McMillan Plan was proposed as an effort to complete L’Enfant’s vision, which included expanding the National Mall. When civil rights Leader Dr. Martin Luther King, Jr. was assassinated on April 4, 1968, the beautiful city of DC erupted into violence as rioters passionately took to the streets and neighborhoods. Fires destroyed numerous buildings and rioting continued for three days, only stopping after federal troops were called in. In 1973, Congress enacted the Home Rule Act which allowed voters to elect a mayor and a city council that would oversee the district. Walter Washington became both the first elected and first black mayor of Washington DC. Best Ways To Experience History in Washington, D.C. 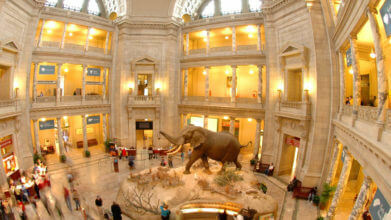 The Smithsonian Institution is made up of 17 museums, galleries and the National Zoo. Millions of artifacts, works of art and diverse items call Washington DC home and are on display for visitors to see and discover. If you’re a museum buff who enjoys strolling through world-renowned exhibits, be sure to add a mix of these to your itinerary. And for the budget conscious traveler, admission to all of the Smithsonian museums is always free. Home to many of DC’s most famous museums, the National Mall is also where you’ll find many of the city’s renowned monuments and memorials. At one end, the Washington Monument, soaring 555 feet into the sky, makes an iconic statement and is considered by many to be the most recognizable symbol of the city. At the opposite end, the site of the Lincoln Memorial will simply take your breath away. And in between, you’ll find architectural masterpieces and history at every turn. Each one was created as an everlasting tribute to those who help shape the USA and made it the country that it is today. America’s most visited national park, the National Mall brings together history, culture and a diverse array of unique sites and attractions. After exploring the famous memorials, monuments and museums, be sure to visit these other must-see destinations. Old Town Trolley One of the best ways to get around Washington DC is aboard the Old Town Trolley. The trolley makes 17 convenient stops all around the city and even at Arlington National Cemetery (with gold and platinum passes.) You can ride it all day long to enjoy the sights or hop off at any of the stops to explore the area. And because there are trolleys coming and going all day long, you can opt to stay at any of the sites for as long as you wish and just catch the next one that comes along. Your knowledgeable driver will share the history of Washington DC and interesting fun facts along the route. This is a great family-friendly experience that is sure to entertain the little ones. And it’s perfect for travelers who enjoy public transportation but are looking for a more personal touch. Another option is to purchase a tour package for even more savings & fun! Metrorail Washington DC’s public transportation system is extremely convenient and provides many ways for you to get around. The Metrorail system is an inexpensive method and includes 86 stations and spans about 106 miles. There are metro stations located around the city marked by a brown pillar with the letter M. There are 5 different routes, the red, blue, yellow, orange and green, that connect to each other at various points. A SmarTrip Card can be purchased at any of the Metro stations and allows you to ride the rail or DC’s public buses. Metrobus In addition to the Metrorail, Washington DC also has numerous bus routes with 1,500 buses traveling on them to help you get around easily. Red, white and blue signs throughout the city identify bus stations and using the SmarTrip Card makes fares inexpensive. The buses travel 325 different routes, which include the major areas and arteries of the city, as well as Maryland and Virginia. Rental Vehicle Car rentals are available throughout the city and at the airport. Keep in mind, this is not an ideal option if you’re staying in D.C. as traffic in the city can be overwhelming and parking is limited and expensive.